If you’re a Gmail user and you’re going to be away from email, on vacation, or out of the office for a while, you may want to set an automatic email responder message directly through Gmail. This tutorial will walkthrough how to configure and setup an automatic email responder for a Gmail account, it can be set from any web browser on any device, including Windows PC, Mac, Linux, iPhone, iPad, Android, Chrome OS, or anything else you can access the Gmail website from. 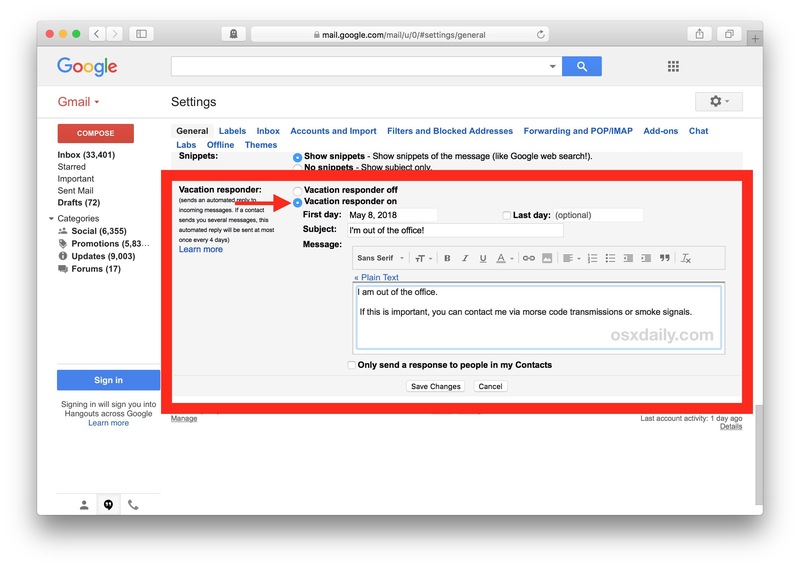 Gmail makes setting up an auto-responder very easy, and you can set start dates and end dates for the vacation responder, or you can have it take effect immediately and last indefinitely until you manually turn the vacation/automatic responder off yourself. Of course you can customize the email reply subject and message too. Using this Gmail based approach is accessed and setup through the web on gmail.com. A significant advantage to this method is that it will handle the automatic responder emails on the Gmail server side, meaning before the email gets to your iPhone, iPad, or Mac, this can make the Gmail-based auto “out of office” responses faster and more reliable than setting them up on a local device, particularly if the device(s) in question are going to be on limited network or cell phone coverage. Note that if you have the Start Date set to todays date (whatever today is), the auto-responder will start immediately. In other words, if someone keeps sending you emails, they will not keep getting auto-reply messages, but will get another one in several days if they happen to send another email at that time. As mentioned before, using the Gmail based approach is great for Gmail users because it handles the automatic responder on the Gmail server side of things, basically as soon as Gmail gets the email in your inbox it will respond with the automatic responder message. That differs from when you setup or use auto-responders on the device side of things, because when an auto-responder is configured on a local device, it must have internet access to check the email and then send a response. For a practical example, this means setting up the Gmail auto-responder directly through Gmail would send the auto-reply message even in a situation where your iPhone, iPad, or Mac has no internet connection – say on an airplane over the pacific or at the top of Mount Everest – whereas the local device based method is not able to do that since it requires an active internet connection to detect and send the auto-reply. Nonetheless, if you’re interested you can also learn how to setup auto-responders for Mail on Mac OS, along with setting up auto-responder “Out of Office” emails for Mail on iPhone and iPad. You can also turn on and adjust the auto-responder in Gmail with the Gmail app for iPhone and iPad, or Android, using the in-app settings much the same way as described here. We’re focusing on the web based gmail client here, however. And that’s it, if you didn’t set an end date where the auto-reply email will stop itself automatically, you can toggle the responder off at any time this way instead. You can turn off or on the automatic responder in Gmail at any time, either through the web or through the Gmail app on an iPhone, iPad, or Android device. Know of any other helpful tips or tricks for setting up Out Of Office reply emails, vacation responders, and other automatic replies? Share them in the comments below! 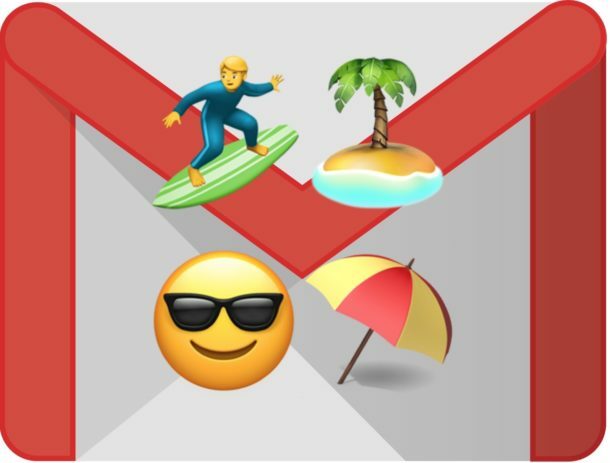 How does Gmail vacation responder work?